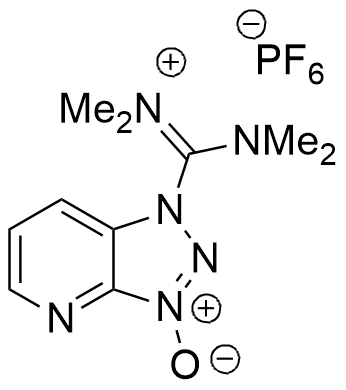 HATU is similar to HBTU, but reacts faster with less epimerization during coupling. Nevertheless, HATU is preferred to HBTU in most rapid coupling protocols (while it is utilized in the same manner as HBTU). HATU should not be used in excess because it can react with the unprotected N-terminal and block further chain elongation. HATU is used for synthesis of Nα-urethane protected β-amino alcohols and peptide alcohols. Used in rapid automated derivatization of solid-phase supports for oligonucleotide synthesis. HATU is a members of the current generation of highly efficient coupling reagents suitable for the synthesis of peptides or proteins containing ‘‘difficult’’ sequences, b-branched and/or N-methylated amino acids. L. A. Carpino, A. El-Faham, C. A. Minor, and F. Albericio. J. Chem. Soc., Chem. Commun., 1994, 201-203. I. Abdelmoty, F. Albericio, L. A. Carpino, B. F. Foxman, and S. A. Kates Lett. Peptide Sci., 1994, 1, 57-67. L. A. Carpino, H. Imazumi, A. El-Faham, F. J. Ferrer, C. Zhang, Y. Lee, B. M. Foxman, P. Henklein, C. Hanay, C. Mugge, H. Wenschuh, J. Klose, M. Beyermann, and M. Bienert Angew. Chem. Int. Ed., 2002, 41, 441-445. L. P. Miranda and P. F. Alewood Proc. Natl. Acad. Sci., 1999, 96, 1181–1186.